Nuremberg, out of all the places we visited during our five weeks in Europe, surprised me the most. It was a place I hadn’t done much research on, for some strange reason. When I decided to stop in Nuremberg, it was mainly because it was a convenient location for making a day trip to Bamberg, which I was dying to see. However, once we arrived I quickly became fixated on Nuremberg Castle, the medieval fortress overlooking the Old Town. Turns out Nuremberg is much more than home to the Nazi Party Rally Grounds and Nuremberg Trials. Had I known that Nuremberg had a romantic air about it, with the castle and half-timbered buildings, I would have dedicated an entire day to exploring Nuremberg and not just part of an afternoon. What a mistake that turned out to be! Walking the empty streets after darkness settled in on the night of our arrival, I felt myself falling in love. That giddy kind of love, where all you want to do is dance when no one is watching. It wasn’t long until I actually was skipping down the cobblestone lanes, humming little songs and feeling totally free. Nuremberg made me act like a fool and I didn’t even care. The only thing I cared about was making it back from Bamberg the next day with enough time to explore Nuremberg Castle, which had been tempting me to visit every time I looked out our hotel window. Nuremberg Castle is one of the most important medieval Imperial palaces. Built on a large sandstone rock, the castle was home to every emperor of the Holy Roman Empire, between 1050 and 1571. Not only a prestigious residence, the castle was an important part of the Empire’s administrative functions. Both the courts and the Imperial Diet (Reichstag) met at Nuremberg Castle. In 1356, Charles IV enacted the “Golden Bull”, a decree which stipulated that newly elected kings of Germany hold their first general assembly at Nuremberg. This helped to make Nuremberg one of the three most important cities in the Empire and attracted increased trade and commerce. There are no organized tours of Nuremberg Castle, so we were free to explore most of it on our own. The only section you need to visit with a staff member is the Deep Well. 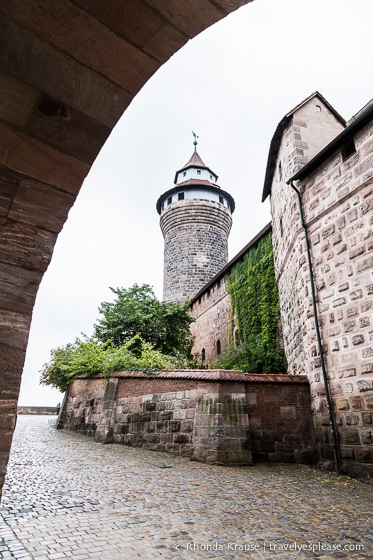 To give you an introduction, here is a guide and photo tour of Nuremberg Castle. The Sinwell Tower was built late in the 13th century and served defensive, as well as status purposes. At the top of the tower you can see old photographs of what Nuremberg looked like after World War II. It wouldn’t be exaggerating to say the castle (and the town) was pretty much completely destroyed. Only the Hasenburg remained untouched. Every other part of the castle was either damaged or completely destroyed. The Germans did a meticulous job of rebuilding Nuremberg Castle back to its historical form. I would say that the well was the highlight of Nuremberg Castle for us. It is incredibly deep, nearly 50 metres and passing through multiple layers of rock. To illustrate how deep it was, the guide lowered a candle chandelier down to the bottom of the well. As if that wasn’t enough, she then poured a jug of water down the hole, leaving us waiting to hear it splash to the bottom. It felt like forever until we heard it splash down, but Mike insists it was only about five seconds. The Romanesque Imperial Chapel was built around 1200 and is considered by some to be the most important part of the castle. Double chapels are two chapels with an identical floor plan placed one above the other, sometimes linked by an opening in the middle. This chapel had to be skillfully adapted to fit with the contours of the sandstone the castle is built on. The Imperial Hall at Nuremberg Castle was used for festivities during visits by the Emperor, as well as a dining hall on an everyday basis. It was rebuilt after the Second World War and contains exhibits focusing on the Holy Roman Empire. The highlight of the Emperor’s living room is the reconstructed ceiling. The four squares in the centre show the double eagle of the Holy Roman Empire of the German Nation with the coats of arms of the main countries. The Corner Chamber contains exhibits centered around the theme of City and Emperor. You can see paintings by famous Nuremberg artists, a wooden model of the city, gifts presented to the Emperor and the Imperial regalia. The eye-catcher though is the Imperial Crown, which hovers over the oldest known topographical model of a German city. This is a great museum for viewing medieval armour and weaponry. The collection has historical weapons from the 12th to the 19th centuries that illustrate both technological developments and shifts in the cultural importance of weapons. Even the horses had armour! Save some time after your visit to the castle to take a walk around the gardens, especially the one on the south side of the great hall. There’s a beautiful circular flower bed neatly surrounded by trees, perfect for relaxing and enjoying the views of the Old Town below. Mike and I both really loved Nuremberg Castle and it was one of our favourite places to visit in Bavaria. The history was intriguing and there were many beautiful objects on display in the different rooms. The Deep Well was definitely a point of conversation afterwards, so don’t miss this demonstration! As interesting as Nuremberg Castle was, my favourite thing about it was how pretty it was. There were so many little touches- red window shutters, flower boxes, cobblestone paths, gardens- that made it feel more like a small medieval village rather than an imposing castle. We would definitely recommend a visit to Nuremberg Castle! Nuremberg Castle is open daily from 9:00 am- 6:00 pm (April to September), and 10:00 am- 4:00 pm (October to March). It closed during some holidays. Admission to Nuremberg Castle costs €5.50. This includes the Palas with double chapel and the Imperial Castle Museum. The Imperial Palace combination ticket cost €7 and includes the Palas with double chapel, Deep Well, Sinwell Tower, and museum. The Deep Well can only be visited with a guided tour and requires a separate ticket. Tickets for the well and Sinwell Tower cost €3.50. Check at the office for tour times. A combination ticket can be purchased for €7.00. This includes a visit to Nuremberg Castle as well as Sinwell Tower and Deep Well. There is no parking at the castle and some exhibition rooms are only accessible by stairs. All prices and hours were correct at the time of publishing but can change without notice. Please confirm directly with service providers. For your convenience, here is a list of hotels in Nuremberg. Please consider booking your Nuremberg accommodations through the included link. It costs nothing extra and helps support this website. Thank you! Frank - Great post. I was last in Nuremberg 20 years ago but we’re planning on going for a visit next summer. What I remember most about the city is that there was a lot of dark stones on the buildings which made the city look almost forbidding – a contrast to places like Rotherburg ob der tauber which look like they popped out of a Hansel & Gretel book. I also remember the great little sausages that are a specialty in the area as well as the fantastic Franken wines. Good job, look forward to seeing the city again.